The good news is our mouths don’t have to deteriorate with age. It is a common myth that senior citizens are meant to lose their teeth, have numerous dental concerns or a smile you don’t want to see in pictures. There is absolutely no reason seniors cannot keep their teeth for a lifetime since tooth loss is simply the result of an oral disease and not the aging process. As you age, the challenges you face in maintaining a healthy smile and teeth change. The better quality of dental care and treatment today has made it possible for many seniors to keep their own teeth and not have to resort to wearing dentures. At pour Pasadena, Texas Dental office we want to help you retain your natural, healthy teeth and smile by offering solutions to common problems faced by our senior patients. Xerostomia also called “dry mouth” is a common problem. The lack of adequate saliva is more than inconvenient for three out of every ten Americans. When the natural flow of saliva is reduced, you can experience pain throughout the mouth, trouble swallowing, gum disease and rapid cavity formation. The tongue sticks, food doesn’t have much taste, and digestion suffers. Dr. Nugent knows that dry mouth can come with aging, or often as a side effect of many medications. About half of cancer patients undergoing chemotherapy experience an extreme form of xerostomia, with critical effects on their dental health. We can help provide relief in the form of prescriptions for dry mouth toothpaste, special saliva-producing chewing gum, or saliva substitute solutions. Vitamin deficiency: there is some evidence linking burning mouth syndrome to Vitamin B deficiency. Solution: Regular vitamin regimen. Medications: these often dry the mouth (side effects). Solution: A change of medications or the use of saliva substitutes. Candida infections: this is a common oral fungus, usually apparent to the eye but sometimes undetectable. Solution: Dr. Nugent can prescribe a topical anti-fungal agent that can help the problem. Many denture wearers breathe a sigh of relief when they get their first pair of dentures because they think their dental problems are over. Unfortunately, they quickly realize they have just traded old problems for new larger problems. Even the best dentures can not compete with natural teeth in ability to chew food efficiently and comfortably. As the years go by, the supporting bone that remain after teeth have been removed gradually melt away and get smaller. Thus, dentures need to be “relined” or “refitted” every 2-4 years so that the denture will conform to the shrinking jawbone. A large change in weight can also alter the shape of the mouth, causing changes in the fit. In the past, the loss of teeth was regarded as a natural part of the aging process and dentures were considered a normal sign of old age. While such ignorance is rapidly becoming a thing of the past, there is still not a general cognizance of the seriousness of edentulism (tooth loss). Multiple tooth loss is most commonly caused by periodontal disease, i.e. gum and bone disease. Periodontal disease has a high statistical correlation with chronic debilitating disease, such as cardiovascular disease, diabetes and arthritis. In addition to longevity, quality-of-life differences are just as significant. The functional efficiency of dentures has been measured to be only 20% of that of natural teeth. Dr. Nugent feels that there cannot be any doubt that nutritional deficiencies will be much more prevalent in those without their natural teeth. Loss of teeth often causes a feeling of loss of wholeness and a sense of deterioration and aging. 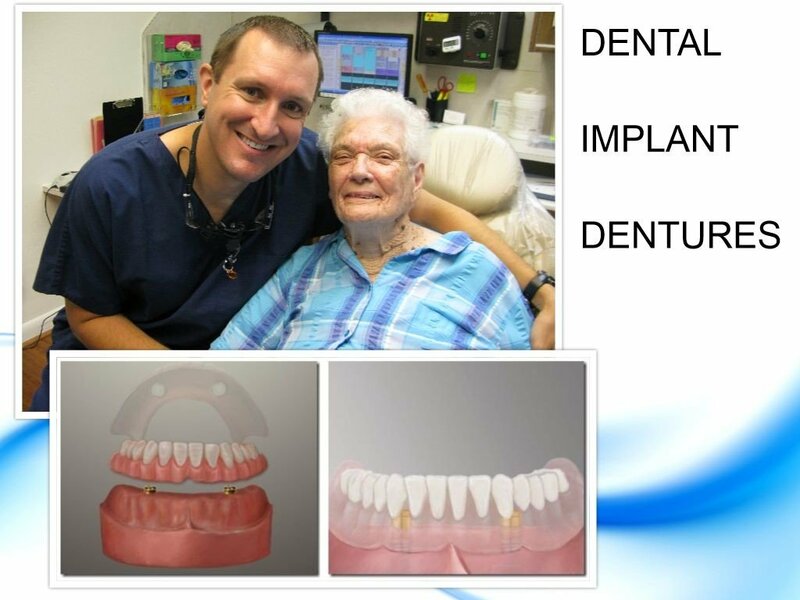 For patients suffering with old fashioned dentures, Dr. Nugent can create stable and secure dental implant dentures. 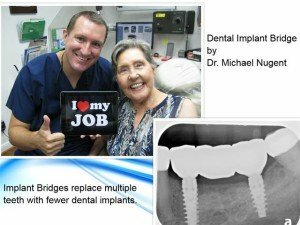 Our Pasadena Dental office appreciates the special challenges that are faced by our senior patients and we are here to help you find solutions that will keep you healthy and enjoying a full and satisfying life. Call our office today at 713-941-8261 to experience award winning dentistry.